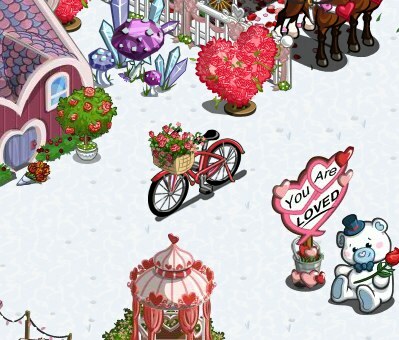 As FarmVille's Valentine's Day theme continues, we're given a fairly small amount of items to choose from in the game's latest update. There are no new trees to speak of in this theme (although Pink Plumeria and Jacaranda Trees have been added in a no-name theme), but there are a few animals and decorations to choose from if you're in the mood to go shopping. All of these items will be available in the game for the next two weeks. It's interesting to see the game's Valentine's Day theme slowing down before the holiday, rather than becoming more prominent, but I wouldn't be surprised if this didn't mean Zynga was working on another large feature for the game, rather than focusing on these store updates. Check out the rest of our Valentine's Day 2012 coverage here. What do you think of these newest Valentine's Day items? Are you disappointing to see no trees released in the Valentine's Day theme in this update? Sound off in the comments.